Found 2 results for tag "talesoftheabyss"
Let's just say that based on what our developers want, they would like the ability to code, develop, design, test, and innovate in-house applications instead of having to conform to deadlines or produce less-than-quality websites. Based on the next upcoming months, we should be moving out of our current office space. All details aside, things just aren't working in our favor to keep it. The move out should happen within the next 60 days. We did receive 2 new clients during the away-time, but we also lost about 5 clients. One client we gained wanted a full-fledge basic website, while the other wanted some custom work done to their current site. Either way, it's good money. 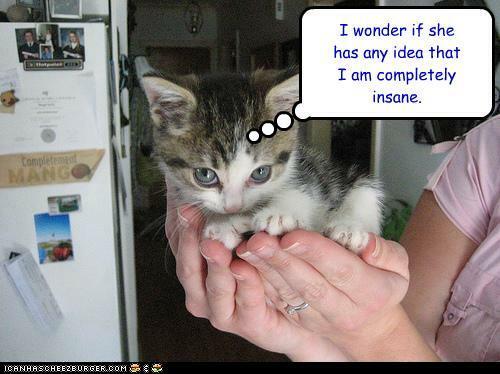 However, we did lose about 5 clients, and (to say what I've told others) I have no specific idea why. So there was some bad to go with the good, but I do believe that this was a sign telling us to get out of the "design client websites" business. Therefore, "message received." (This can be classified as either business or personal, but either way) I signed up for CoFoundersLab.com, which is basically a Match.com for Entrepreneurs. Overall, I like the concept, and within the first few days of signing up, I already had a meeting with a potential business partner in Asheville. (I put on there that "[I am] looking for someone to join [me]" to help bring all of these SaaS services up to speed. We can produce the code if they can manage the business) After the meeting, things went well, but not as well as expected. I was later contacted by many people who were looking for me to join them. When I explained that I already had prototypes of my services and were looking for someone to join me, they backed off. However, I did receive one good contact from Atlanta who (after a lengthy phone conversation) will send me investor connections he has. So, things look good so far. I beat Tales of the Abyss (finally). When I last played it, it took me over 70 hours to play fully, and when I reached the final boss, I could never beat him. Using a walkthrough I found (supercheats.com/playstation/walkthroughs/talesoftheabyss-walkthrough01.txt), I was able to level up appropriately and beat the final boss on the first try. I got to see the end of the game, and I'm playing through again with 2x the experience, which should allow me to beat the stronger optional boss at a later time. Yay! Keat and I have started (seriously) began planning for the wedding. I'm saying "seriously" because her parents are finally getting serious. We have pretty much everything planned out, including: the locations, the downpayment schedules, the overall budget, the payment logs, the tuxes, the reception menu, the program design, invitation design, Save the Date designs, groomsmen, bridesmaids, preacher plans, limo scheduled, flowers, etc, etc etc. The only things that we have left are to finalize everything, test/decide on the cake, and order the printing material. Just over a year to go. I was interviewed for the Magnet Program for Wake County Public Schools. I wasn't quite sure what to expect (since I had been through the magnet program since 1st grade and didn't have anything to compare it to), but I went down last Tuesday, went through the interview on Wednesday, and got it over. I finished my Python program through Coursera and received a 90.6% with distinction (I didn't do the first week's quizzes). Not bad for my first online course. I tried to enroll in a "Programming with Design" course, but that seemed to be more of a "how to emphasize design in programming" geared more towards designers with little to no coding, so not really my kind of course. I also tried enrolling in an Algorithm course from Stanford, but I did not have the time during my week to watch 20 hours of videos each week, so I had to unenroll myself out of that course. I've tried to install Ubuntu on my home server and failed miserably. After multiple, multiple attempts at trying to install it, I believe the issue was that my hard drive had officially died. I don't mean "dead as a doornail" kind of dead, but it could not have anything else written to it, so I cannabilized the spare office computer and inserted the hard drive from it into my machine, and I'm using that version of Ubuntu on the old mainframe. Not pretty, but it works. Keat and I have picked walking back up. Based on the past few weeks, we are doing an average of 2.5 miles a night, at a pace of 2.2 mph, which isn't bad. I'm sure I can go a lot faster, but I'm going Keat's speed, which is fine with me. I'll get up to running around the block again....one of these days. I finally saw "Doctor Who: Planet of the Dead". This is the one Tennant movie that I could not get via Netflix or any other online streaming source (aside from BitTorrent), and while I was in Raleigh for my WCPSS interview, it was on BBC America! So I got to watch it! YAY! One of my favorite animes, Sword Art Online, got an American adaptation with dubbing. Now, I know that I'm probably being prejudicial by saying "The American version won't be as good as the Japanese version", but in this case, I can freely admit that. Based on my previous blog posting, I said that I had a fan-crush on Asuna, and I meant that. However, when I heard that Toonami was picking up SAO when ThunderCats ended, I was excited....and scared. When I heard Episode 2 (that's the first one that we get to hear Asuna speak), I will admit that they didn't do anything to capture Asuna's spirit or personality. In addition, the same actress that played the daugter (Natsumi) in Sgt. Frog voices Asuna. I was semi-okay with the voice-over work, until the tail end of Episode 2 when Asuna said "I'm so stupid". At that point, I didn't see Asuna anymore, but the pink haired main female character from Sgt. Frog: Natsumi Hinata (don't get me wrong: Sgt Frog is a great, yet stupid, series). And...that ruined it for me. I still prefer the original Japanese version any day of the week. I got a haircut. Yes, I know. "What a shocker!". I thought "It was time for me to get rid of the ponytail and get with a more realistic haircut....how about a 'David Tennant' inspired style? ", and that's pretty much what I was aiming for. Not perfect, but I have a year to get it right before the wedding. Wow, has it really been over 2 months since ConCarolinas? Keat and I attended Con during the first weekend in June and it was really fun. We saw the Team Tardis Cosplayers which did an amazing job cosplaying Doctors #9, #10, and #11, with an awesome real life Dalek, Keat entered into a Costume Contest as Katniss and she should have won (personal arguments against the actual winner aside, and the judges for making the contestants and audience wait 4 hours for a result), we met up with a lot of friends, attended a few parties, got a bunch of stuff, then drove back. 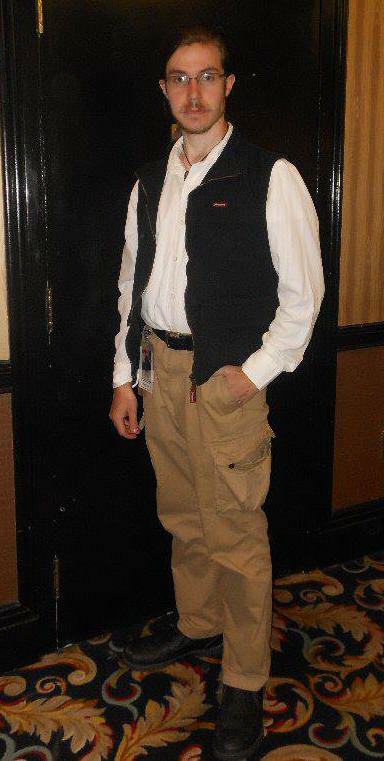 I didn't have much of a costume, so I threw together some khaki's and a button up white shirt, trying to be Jamie Hyneman (I can't be Adam Savage), but it turned out more "Han Solo" than "Mythbuster" (see below image). Oh well, better luck next time. That's it for now. I'll try to get back in to posting soon, as soon as I can get back into it. I finished TNG on Netflix. I've now started DS9. I know Pilots aren't always great, but I know DS9 gets better as the seasons go on. I've moved my desk to face the door at the office. According to Janet, it balances the Feng Shui, and I think I have more confidence because of that. Keat and I went to my parents for Thanksgiving. My sisters weren't there, so it was fairly quiet and not much happened. We also visited Keat's parents and went to a basketball game at State, then visited downtown Raleigh some. We have a neighbor across the street that we've never met. Her mother died on the 16th. It was a chaotic situation trying to get everyone to calm down and the EMS's there. I do wish we met them on better terms instead of that. Working on a new marketing "packet" for clients. This may be a great incentive for new clients, and may give us a new stream of revenue....? I'll stop at that. We are heading to my parents and Keat's parents over Xmas break. Depending on how things go, I may be able to post. I will if I can.